BANGKOK – December 3, 2013 – True to its heritage of creating exceptional resorts and spas featuring unique, crafted guest experiences in places of incredible natural beauty, Six Senses Hotels Resorts Spas announces eight new development concepts set to open over the next 36 months. Growth also includes the addition of four incredible Six Senses Spas and the brand’s broadening expansion into the lifestyle of wellness. 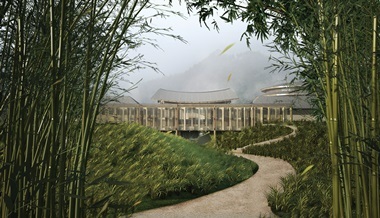 Six Senses Qing Cheng Mountain, opening in 2015, is the only resort located adjacent to the UNESCO World Heritage Site in the Chinese province of Sichuan. The 113-suite and-villa resort has been brilliantly designed to incorporate regional architecture and landscaping, resulting in an extraordinary cultural offering with a strong sense of place wedded to contemporary attitude. Chengdu Shangliu International Airport is a one-hour drive from Six Senses Qing Cheng Mountain and Chengdu City is 30 minutes by car or rail link. Demonstrating that Six Senses’ ethos adapts wonderfully to all locations of great natural beauty, the 32-suite Six Senses Mont Blanc is nestled in the French Alpine area of Saint-Gervais-les-Bains and offers an extraordinary 180-degree panorama of Europe’s highest peak. The mountain top resort sits on Mont d’Arbois and with over 280 miles (450 kilometers) of surrounding ski-in, ski-out runs; Six Senses’ guests have first access to untouched morning powder. 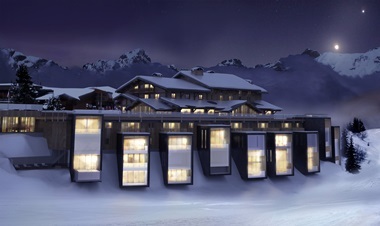 Opening in 2015, its’ unique setting offers seclusion and privacy outside of ski hours and a generous diversity of experiences. It is a one-hour drive from Geneva and ten-minute gondola ride from Megève; the resort is accessed by cable car, snowmobile or helicopter. Six Senses Bhutan allows guests to experience the depth of this wondrous destination of stunning natural scenery by creating five properties for the ultimate circuit experience. With a total of just 82 guest suites distributed between five intimate lodges, the project creates a Six Senses journey that comprises Thimphu, Punakha, Gantey, Bumthang and Paro. Also opening in 2016, the five guest lodges reflect the heritage and hospitality for which positions this colorful Kingdom as the Happiest Place on Earth. Located in the Jhih-ben hot spring area of Taitung in southeastern Taiwan, Six Senses Wuma is located at the base of Medicine Mountain and features stunning views of the surrounding valley and mountains. Opening in 2016, the resort is designed by leading Japanese architect Kengo Kuma, internationally regarded and respected for his ability to deeply and intimately celebrate and frame nature through design. Comprising just 50 suites and villas, the resort sits lightly upon the 20-hectare (50-acre) site, occupying just ten percent of the project site. Access to Wuma is 25 minutes from Taitung Airport, which can be reached by air from Taipei in 45 minutes and with charter flights from Hong Kong and China. In addition to the glorious landscape of rolling hills and valleys, Six Senses Ninghai in China also features a natural hot spring on site. The 129 villas offer a sense of heritage presented with modernity and drama, with some accommodations perched on a hillside. Approximately 45 minutes from Ningbo International Airport it is also a convenient three-hour drive from Shanghai. An allotment of villas and suites is offered for sale to those wishing to enjoy an all-encompassing Six Senses lifestyle. St Lucia, one of Windward Islands in the eastern Caribbean, is renowned for its high life and style, and Six Senses Freedom Bay now adds yet another breath-taking dimension. Dramatically located inside the Pitons, a UNESCO World Heritage Site on the southwest coast of the island, the 70 acre (28 hectare) rainforest site rests at the foot of two volcanic spires fringed by a long sandy beach. Opening in 2016, the resort features 73 pool villas and pool suites with all spacious accommodations providing dual dramatic views of the turquoise ocean and lush Pitons. The resort includes a private Beach Club and 53 residential units accessed by a 45-minute drive from the international airport or 10 minutes by helicopter. Long referred to as The Island of the Gods, the kaleidoscope of color and culture that is Bali, is the setting for Six Senses Uluwatu. Spectacularly situated cliff-top at the southern tip of the island, the 120-suite and villa resort is an integration of Balinese cultural expressions through design. Surrounded by a 65,000 square foot (6,000 square meter) garden, it is a 45-minute drive from the international airport. Expansion plans would not be complete without a resort development in North Africa’s Tunisia. Six Senses Gammarth is ideally located on the Mediterranean Coast near the capital of Tunis. Offering 67 suites and pool villas plus 31 residences, the low rise, low density resort faces the sea and celebrates the country’s rich Berber, Ottoman, Arab and French cultural history through architectural references, tenting and interior design. On the wellness front, this month marks the opening of Six Senses Spa at Esentai Tower. Located in the heart of Almaty, Kazakhstan, the spa is a welcome haven for outer beauty in the inner city. Everything resonates with Six Senses' inimitable sense of style and fun; the effortlessly cool and sophisticated design and the uncompromising attention to detail together with the relaxed and intuitive approach of our hosts. The spa features five treatment rooms, lounge and retail area with juice bar, fitness center, studio for wellness activities, wet facilities within female and male changing rooms and relaxation sound pods. Known as the tallest residential building in the world, built on one of the most expensive pieces of land, Six Senses World One is located in Mumbai’s Worli district. Six Senses will manage the entire club house designed for residents and select external guests. The club is spread over three floors; a podium area provides for a true green oasis in the middle of the Indian metropolis. An area of over 86,000 square feet (8,000 square meters) has been designated for the facility. The focus is on wellness and the creation of a fantastic club concept including innovative restaurant concepts, interesting options for social gatherings and events, an array of fun activities and areas for children, walking and jogging trails plus services for pets. The spa facilities include relaxation areas, indoor and outdoor recreational services, a variety of wet area circuits along with lap and outdoor pools. Less than three hours by car from Mumbai lies the city of Pune, where the Evason Pune Belmondo project lies. Located approximately 20 minutes from downtown Pune, Evason by Six Senses will manage the entire club house which is approximately 69,000 square feet (6,400 square meters). The club house is built over three levels and includes two restaurants, meeting room, banquet hall, kids’ area spread over two levels, games rooms and library. The facility also incorporates a gym, yoga studio, pool, several indoor and outdoor relaxation spaces and a spa with eight treatment rooms – each different and unique, Hammam and changing rooms with wet facilities. Six Senses Spa at Al Bustan Palace sits 980 feet (300 meters) from The Ritz-Carlton managed resort in its own little wadi (valley) complete with two secluded beaches. The building itself makes for a true Omani architectural jewel hidden and flush with the landscape of the soaring mountains. It follows the shape of the landscape and is hence built over three floors. There are 20 treatment rooms, a majalis (relaxation area) and several falaj (water feature) that make for a must see building. It is built to replicate a fortress where one enters through a large door and then extends into smaller areas. It has distinctive ladies and gents’ area and an additional club for ladies only featuring a private gym, pool and beach. There are several Hammams built around the spa and treatment rooms providing special touches such as a couple’s bath tub, with individual sound pods. Six Senses Hotels Resorts Spas is a management and development company, which manages resorts under the brand names Six Senses and Evason, plus Six Senses Spa. Six Senses: A focus on the incredible natural beauty of locations, together with generous personal spaces, constantly creates something new to discover. Six Senses offers individual style with a unique and diverse design personality, plus a strong sense of community. Six Senses Spa: A key element of all Six Senses properties, Six Senses Spa offers a wide range of holistic wellness, rejuvenation and beauty treatments administered under the guidance of expert therapists. Six Senses Spa is also hosted by prestigious hotels and resorts in many other locations. Evason introduces a collection of unique resorts that follow the Six Senses philosophy of uncompromised responsibility to sustainability and to the community. Family friendly, these properties also present a strong value focus while offering a vast array of guest services, personal attention and facilities.